How You Earn Points - As a Starwood member (without using this card), you can earn 2 points/$ you spend at Starwood Hotels. If you have elite status, you will earn 3 points/$ instead. As a card member, you will earn 2 additional points. That means you can earn total of 4X or 5X (depending on whether you have elite status or not). It means that by having this card, you can up to double your points earnings. Annual Night Stay and Credits - Every year (before 15th February), you will receive 5 nights and 2 stays in your SPG account just from having and using the card. This will help you towards achieving elite status. For example, to achieve Gold Status, you will need 25 nights. That puts you 20 nights away from achieving that. For Platinum Status, you need 50 nights. So by having this card, you will only need 45 more nights. Annual Fee - $95 - waived for first year. Foreign Transaction Fee - None. Which is great since many potential card holders are travelers and will be traveling abroad. Free Premium In-room Internet - Card members will get free in-room internet service. Complmentary unlimited Boingo Wifi - You need to enroll with Boingo. But you will get their service for free. Convert StarPoints Into Airline Miles - One of the best feature of this card is that you can convert Starpoints into Frequent Flyer miles other their partners. We shall explore this next. One of the main attraction of this card is the fact that Starwood's reward program is flexible and highly regarded. Consumers feel that they get value from the card. We will highlight all the ways that you can redeem your Starpoints. 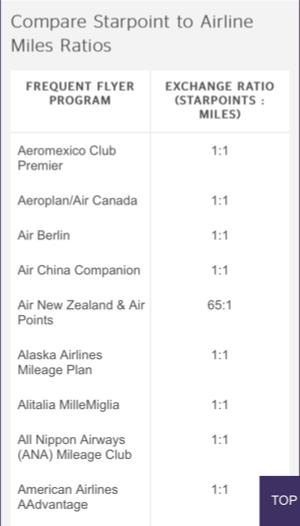 Transfer StarPoints To Miles - The Starwood Preferred Guest Program has over 30 airline partners. This is more than the Membership Rewards, Diners Club, and Chase Ultimate Rewards program. The screen shot below shows the list of airline partners. Notice that for most airline partners, the transfer ratio is one for one. Furthermore, if you transfer 20,000 StarPoints to your FF miles, you will get a 5,000 bonus miles from Starwood. You are allowed to transfer up to 79,999 StarPoints within a 24 hour period. That means including your bonus, you will move 94,000 Points (79,999 + 15,000 Bonus Points). Because of the bonus feature, you should be transferring your points in 20,000 StarPoints increments. Perhaps the only weakness in SPG offerings is that the transfer ratio for United is 2:1 and SouthWest is not a partner with them. If you fly those airlines and are looking for an alternative or an addition to their affinity cards, then you have to go with Chase because their Ultimate Rewards program has United and SouthWest as their partners. The Chase Sapphire PreferredSm Card would be the card to get then. StarFlights - Another feature that Starwood has added to their program is the ability to book flights directly with StarPoints. Another feature that Starwood has added to their program is the ability to book flights directly with StarPoints. In fact, the number of points required versus the value of the ticket is listed on their site and below is a screen shot. Because the number of Starpoints needed are priced based on the airline tickets itself, this will lead to interesting opportunities and value on airlines that do not base their redemption options on price (but rather regions). If nothing else, it gives you another option on how you want to use your points for airline tickets. For example, there are instances where you need less StarPoints than a frequent flyer miles. Free Night Awards - When you book four consecutive award stays, Starwood will give you the fifth night free. If you look at enough hotels, you will find that the number of points needed for a night's stay does not always correlate with the actual cost of a room. This sets us up for either great deals or pretty shabby ones. In general, the best deals can be found in category one or two deals. The bulk of Starwood's hotel is really in category 3 and 4. For upper categories, you would also be able to find deals since the number of points requires does not change a lot during peak seasons whereas actual room rates do. Here is an example of a great deal. As we mentioned earlier, this is one of the most popular card with the frequent flier community because of the ability to transfer points to airline partners as well as it's great loyalty program. Firstly, with this card, you could potentially earn up to double the points than you have without a card. If you are not an elite member, you can 2X. With Elite Status, you earn 3X. With this card, you earn an extra 2X. So for non-elite members, you are doubling the points you earn. As a comparison, Marriott members earn a base of 10X. With the Marriott card, you earn 5X. That means with the card, you earn 50% more points (which is pretty common for most hotel affinity cards). The other thing that makes this card attractive is that every year, card members will receive 5 qualifying nights and 2 stay credits. Many other cards give anniversary nights. But what this card gives is important because SPG has allowed their members to earn lifetime time elite status. The criteria is as follows. To be a lifetime elite gold member, you require 250 qualifying nights and 5 years of being an elite Gold member status. You do not need to be Gold member for 5 consecutive years. Instead, as long as you have been for five years, it is sufficient. To achieve lifetime platinum status, you need 500 qualifying nights and 10 years of being a Platinum member. By being a card member, you will automatically earn 5 qualifying nights and 2 stays every year. This will help you achieve the elite status faster. Another thing to take note of is that Starwood counts any nights you stay using your StarPoints award as a qualifying night (unlike Hyatt). Hence, simply earning points from your credit card spending and redeeming them for your stays count and help you achieve the lifetime status faster. 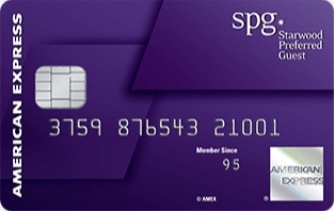 To sum up, this card would be a great addition in your wallet if you are a frequent guest member of SPG and if you aspire to achieve lifetime status. It is also a great card for the true frequent flier and those looking to get involved in the FF miles game. The number of airline partners which you can transfer points to is the key attraction (plus the 5,000 bonus miles when you transfer 20,000 points). It helps you to top up your FF account when you are short and it has a great loyalty program as well. If you redeem your points wisely, each StarPoint could be worth as much as 4 cents. There are other ways in which you can get more out of your card. And that involves combining this with other cards. For example, if you get this card and also the business version, you can earn more nights stay. We mentioned earlier that you get 5 qualifying nights and 2 stays every anniversary. You also get that with the business version so if you have both cards, you will get a total of 10 qualifying nights instead of 5 if you have one card. That means you are even closer to getting your elite status. Depending on how many nights you stay at Starwood Hotels, this may be something you should explore. Another favorite combination is to pair up this card with the Platinum Card from American Express, which gives you automatic Gold Status just for being a card member. Hence, within 5 years of carrying the Platinum Card, you would have fulfilled part of the lifetime gold elite status (which is to be a Gold member for 5 years). You obviously still need to meet the required nights.